I got a little worried a few weeks ago when I thought I noticed slightly more shed hairs than usual, after gently finger combing through my hair. I'm still not sure whether or not I was making a big deal out of nothing, but I decided to do a bit of research into hair shedding just in case. Shedding is the loss of hair from the root. It is a natural part of hair growth. 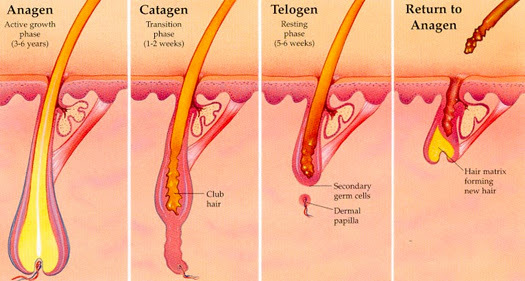 Every strand of hair goes through a series of stages known as the "Growth Cycle", before eventually falling from the follicle to allow a new strand to grow. 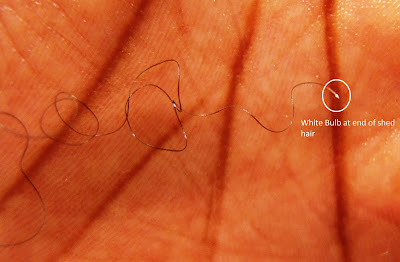 i.e Every individual hair strand has a life span before it leave the scalp. 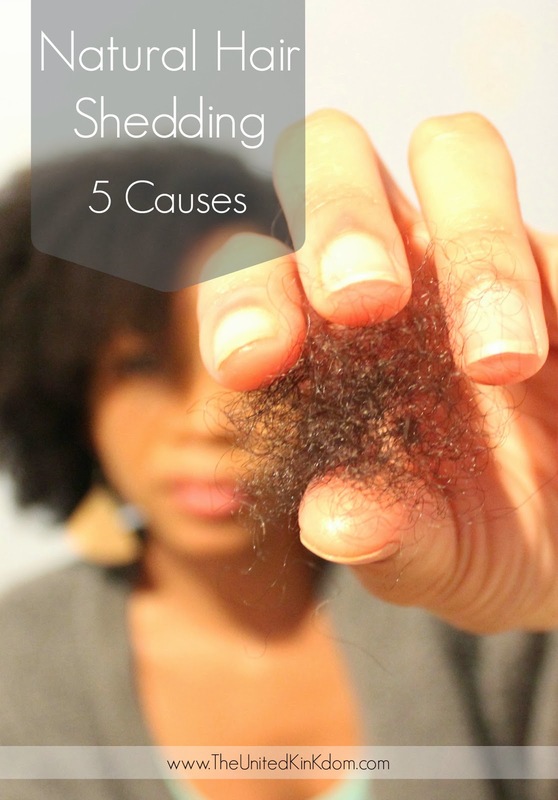 Shedding IS NOT THE SAME AS BREAKAGE! There are loads of blog posts out there stating the difference between shedding and breakage. 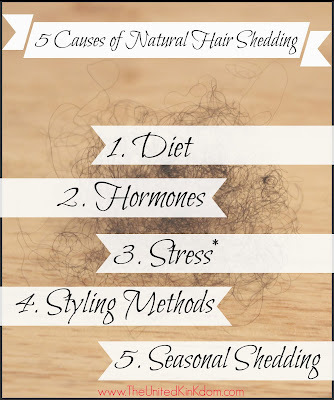 In brief shedding is more commonly the result of internal factors where as breakage is more often the result of external factors. Shed hairs leave from the follicle when the body is ready to let them go, so they often have a little white bulb from the root attached to the the end of them. Keeping both shedding and breakage to a minimum is an important part of achieving optimal hair growth. A certain amount of shedding is just a natural process and completely healthy but there are a number of things that can throw the body out of balance, and cause an increased rate of shedding. A poor diet will leave the hair without the necessary essentials for healthy growth. Common examples include diets lacking in protein or vitamins and minerals such as iron, or vitamins B and D; as well as high consumption of alcohol. Hair growth is largely dictated by hormones. Think puberty. Therefore changes in hormone levels or imbalances can result in increased hair shedding; consider things such as the menstrual cycle, birth control pills, and the menopause, for example. I also did a bit of research into what exactly DHT (Dihydrotestosterone) is, as it's often mentioned in relation to hair loss. Essentially DHT is a form of Testosterone (a hormone). Although men have much higher levels of testosterone, it is also traceable in females. DHT can cause hairs to shed when it comes into contact with an enzyme (Type ii 5-Alpha Reductase), which is located somewhere around the hair follicle. It destroys the follicle by gradually reducing it in size, resulting in a shorter life span for the hair strand. Shedding as a result of stress can often occur weeks or months after the initial event. Common examples of stress on the body include major surgeries or treatments, general illness, thyroid disorders and pregnancy. Excessive combing, brushing, and pulling of hair are all potential culprits. Many people experience hair loss around their edges as a result of too much pulling. It's also important to avoid detangling hair from the root to the tip. Afro hair is best detangled from the tip, gradually working up to the root. A change to your regular hair care routine, can apparently cause a period of slightly increased shedding. 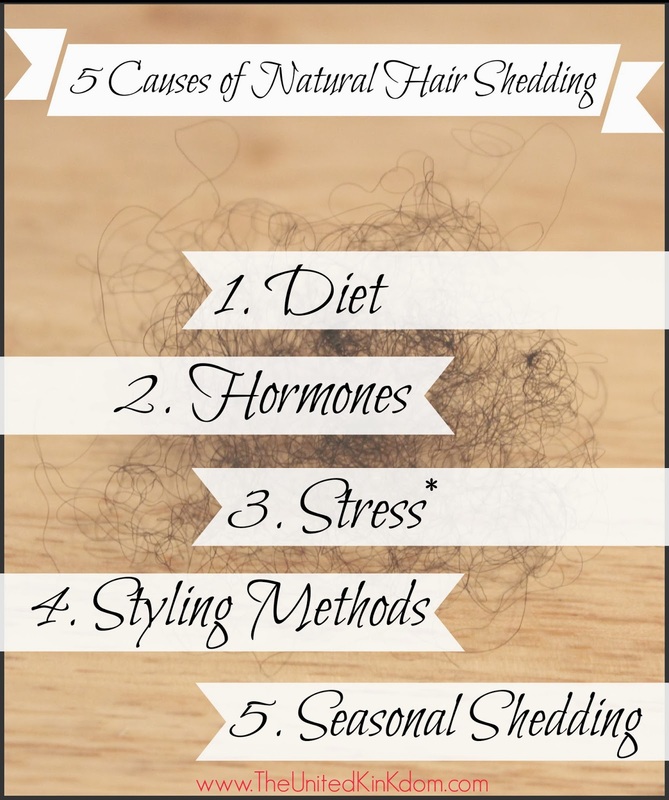 Apparently the studies on this revealed that a period of slightly increased shedding occurs most commonly during the Spring & Autumn seasons, and can last for a few days or sometimes a few weeks. There are many other factors that can cause people to shed more hair than usual, such as high blood pressure, undiagnosed health issues, bad reaction to products, or simply a hereditary condition. The above is just a summary. If you want to check out some of the articles & blog posts I read before writing this post, I've shared them all on one Pinterest board which you can flick through and follow >here<. Because shedding is often the result of internal factors, I strongly recommend checking with your doctor if it's something that's concerning you. Have you ever worried about hair shedding?